This planting terrarium is elegant and beautiful, with a round hole at the very top that allows you to add plants, or other decorative items with ease. The small hole in the back allows you to attach this glass vase to any wall using appropriate mounting hardware. Great for weddings, showers, holidays, parties, offices, and home decor. It will add simplicity and modern style to your sweet home. Also, it can bring eye-catching style and natural beauty to any space with this hanging glass vase. Material: High boron silicon heat resistant glass. This planting terrarium is more perfect if matched with white rocks, pebbles or acrylic. With a round hole at the very top that allows you to add plants, or other decorative items with ease. 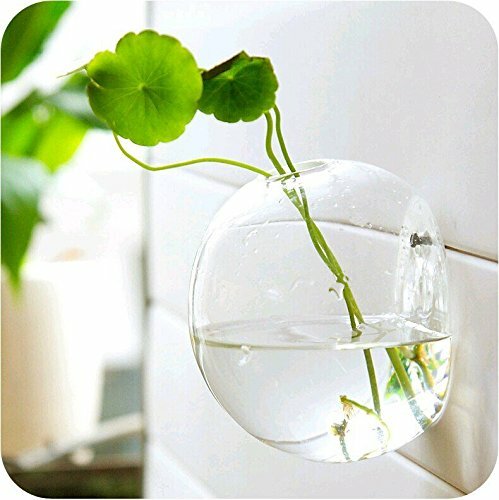 The small hole in the back allows you to attach this glass vase to any wall using appropriate mounting hardware. Easy hanging or taking off the wall. Package Included: one empty glass planter and no-mark wall hook. No plant or other decorative objects included in this item! Size L: Diameter 5.9". Mkono is a registered trademark and our product is professional manufacturing and sole selling.